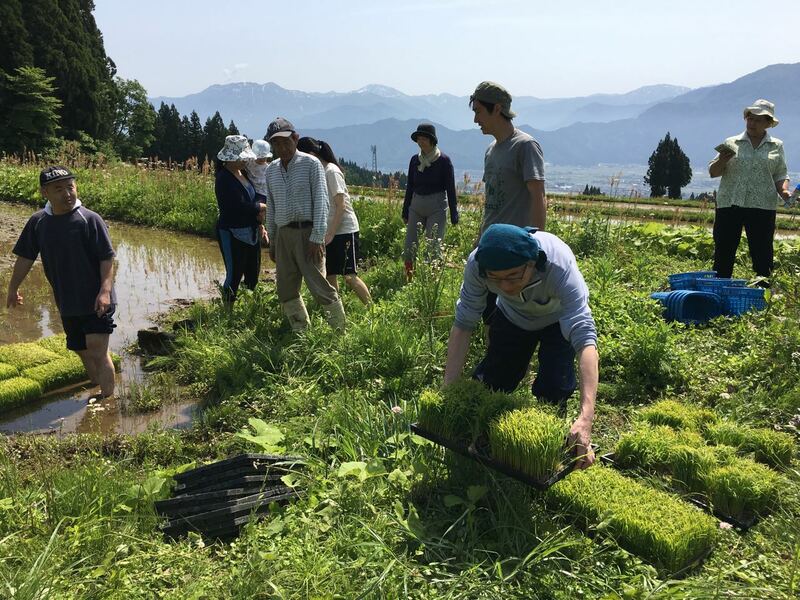 On 26 and 27 May, ECOPLUS conducted “a weekend farming workshop; rice planting” in Tochikubo village in Niigata Japan. Under the limitation of lodging space, we had eight participants from Niigata city and Metropolitan area. We had water shortage caused by extremely small snow in previous winter in 2016, and low temperature and wet condition in 2017. This year we had enough snow as same as usual years but temperatures went up after March and it melted snow substantially. Farmers are worrying again the shortage of water. On Saturday, we started planting seedlings in a smaller paddy which has around 800 square meters. Those paddies which have been growing rice without any chemical materials, the area was filled with so many creatures, like tadpoles, dragonflies and butterflies. Thanks to the strong sunshine, surface of the mud is very warm. We set 4-6 seedlings in one position 1 centimeter under the surface. One of the participants was came from Thailand but she was from the central part of big city, Bangkok. She and his Japanese husband were so good at planting works although it was the first time for them. 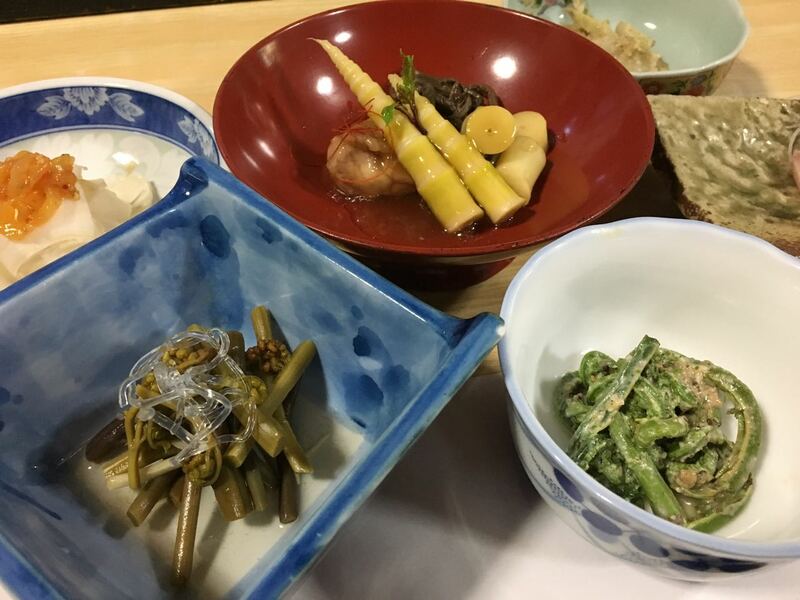 At the dinner so many dishes using wild vegetables just harvested by the chef from their hills were appeared. Some were boiled and mixed with sesame source or vinegar source, some were fried as “Templa”. We enjoyed the gorgeousness of the life in the mountain. It was also very nice weather on Sunday and one of the participants succeeded to see the beautiful sunrise at 4 o’clock in the morning. After finishing rice planting using one hour and so, we had open air lecture from Mr. FUEKI Akira, a veteran farmer. He explained that in old days when the paddies were much smaller and narrow, they conducted rice plantings one paddy to next one moving water from upper paddy to lower one. He also taught that normally 20 pesticides, weed killers or other chemicals were used for rice growing in one season but for this totally organic rice paddy he uses no chemicals. Because of this, he needs to weed by hands at least three times before harvest in each paddies. 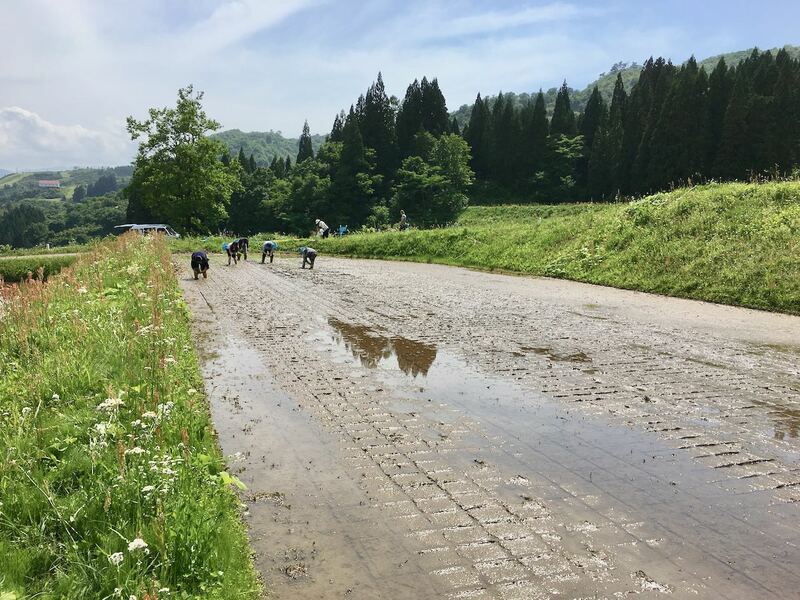 Participants left comments, like “Superb scenery”, “Quietness and songs of birds were impressive”, “I know understood how hard to grow rice”.